All Pilar Cabrera really wanted was to do a little promotion for Oaxaca, and make a few Canadian dollars during one of the slowest months of the year for tourism. But by the end of Chef Pilar's four-week September visit to Toronto, she had set both local and national media on fire - so much so that coverage of her trip resulted in every restaurant in which she was scheduled to cook being sold out; she had to turn down last minute requests to work her culinary magic at additional private dinner parties and cooking schools. The stellar reviews throughout the trip kept chatter alive; Sheryl Kirby of TasteTO.com described her cena at Frida, a highly praised Mexican restaurant, as "one of the best meals of my life," then continued to note "the sheer brilliance of Cabrera's 30-ingredient authentic Oaxacan mole." Like many Oaxacan women, Pilar learned to cook from her mother and grandmother. But when the time came to think in earnest of her future, her path diverged from that of others. While living in Mexico City she earned a degree in food sciences and nutrition, and thereafter worked in research and development for food giant Herdez, McCormick. 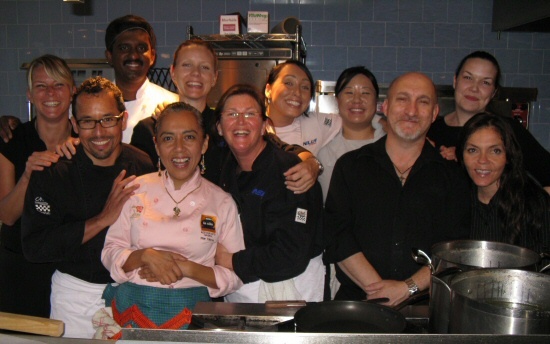 She then returned to Oaxaca to open Restaurante La Olla, and Casa de los Sabores Cooking School. Pilar has been featured in publications such as Bon Appetit and The New York Times, and lauded by the likes of acclaimed restauranteur Rick Bayless who regularly brings his staff to Oaxaca where they take her classes. Over the years she had been offered and then rejected opportunities to teach and cook outside of Mexico. It was not until Spring, 2009, at the encouragement of this writer, and with the invaluable media and culinary industry contacts of Toronto food researcher and writer Mary Luz Mejia of Sizzling Communications, that the Toronto tour became a reality. A planned two week tour rapidly turned into three, as eateries and a prominent cooking school expressed immediate interest. The trip was extended to four weeks when Adriana Becerra - Serrano, Community Affairs Liaison at the Consulado General de México learned of Pilar's trip and asked her to represent Mexico at the Toronto Harbourfront Centre International Hot & Spicy Food Festival - Pilar was a judge at the Emerging Chefs competition, and was pitted against Louisiana in the Iron Chef main event. Throughout September, the diversity of plates Pilar prepared was matched only by the broad range of restaurants and teaching venues in which she plied her trade - as honored guest chef, and as instructor. At the high end was Frank, the 120-seat dining room of the Art Gallery of Ontario, with a menu which included tiger shrimp al mezcal skewered with mango, fresh Ontario sweet corn bisque garnished with pomegranate, and chicken breast stuffed with mushrooms and poblano chile atop a bed of tomatillo salsa. Pilar's opportunity to showcase Oaxacan botanas came near the end of the trip at Torito Tapas Bar where a packed house munched on tostaditas with habanera-marinated red snapper and with octopus a la hierba santa, red mole tacos, mushroom and epazote quesadillas, bacon and cheese memelitas, with pastel de tres leches at the finish. Pilar spent two days at Nella Cucina Culinary School. Managing Director Joanne Lusted lauded Pilar and Ms. Mejia for somehow managing to sell out sessions totaling 80 students, where prominent Canadian chefs had failed to attract such numbers. And at The Chef's House, the restaurant and hands-on teaching facility of The Institute of Culinary Arts at George Brown College, Pilar taught both chefs and students, ultimately providing totally enthralled foodies with the likes of potato and chorizo molotitos, sopa Tehuana, pescado Istmeño, flan de vainilla with seasonal berry coulis, and café de olla. Media activity began prior to Pilar's arrival, with a flurry of blog activity. 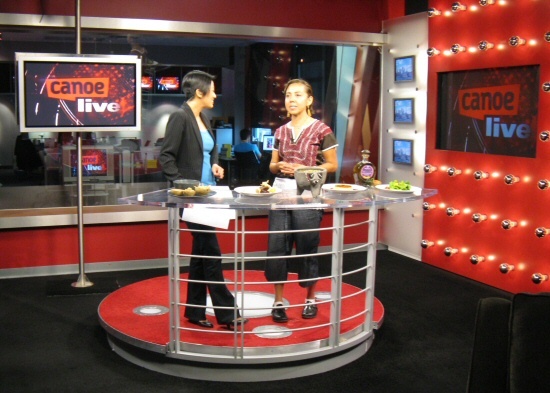 Then the day after her arrival she was live on National TV, showcasing five dishes she had prepared that morning, as well as Herencia del Mezcalero mezcal. In a Toronto Events column of the Toronto Sun newspaper, Pilar's tour was noted ahead of President Bill Clinton's much-touted talk to Torontonians. September 11th she was in the test kitchen of The Toronto Star preparing moles - verde and amarillo. "I was nervous about being able to source the ingredients I would need, in Toronto, especially for dishes like verde," Pilar admits. "I knew the newspaper would not publish a recipe unless all ingredients could be purchased locally. I was amazed at how many of our herbs, chiles and other foodstuffs are found in Kensington Market." And so was The Star; on the 16th it ran almost a full page about Pilar in its Entertainment & Living section. While the photograph of George Clooney promoting the Toronto International Film Festival was a bit larger than that of Pilar, Jennifer Bain, The Star's food editor, was allotted much more space to write about our own Oaxacan star. Other media coverage included articles in magazines such as City Bites (distributed with The Globe and Mail), and a wonderful little piece about Pilar's take on huitlacoche, aired nationwide on Canadian Broadcasting Corporation's Here and Now. All told, Pilar judged, competed, cooked and instructed 11 full days and evenings, in addition to at least an equal number preparing - sourcing ingredients and meeting with administrators and chefs. The epic journey did allow a few days for visits to several museums; Niagara Falls, Niagara-on-the-Lake and tastings at wineries; a cottage on Lake Simcoe for relaxation; and even Casino Rama ("not for me, but it was interesting to see Las Vegas - style gambling"). And there was an opportunity to sample ethnic eateries including Thai, Sechwan, Ethiopian, Indian, Jewish and Greek; as well as indulge at restaurants ranging from the finest of French (Auberge du Pommier) to neighborhood jazz and wings bistros. "The warmth with which I was welcomed into the kitchens of other chefs to ask and learn, and the appreciation shown for the little I was able to impart to Torontonians about Oaxaca, was truly remarkable. There is so much the people of Toronto and Oaxaca can learn from each other, relating to gastronomy and other aspects of culture and tourism." Indeed. The tour has ignited interest in future tours by Pilar as well as other Oaxacans. With the continued support of the Mexican Consulate in Canada, and the willingness of the Mexico and Toronto Tourism boards to jump on the bandwagon, perhaps the State of Oaxaca will see the benefit in providing more support and encouragement for its own to travel abroad, for the benefit of all Oaxacans. Alvin Starkman has a Masters in Social Anthropology from Toronto's York University, and a law degree from Osgoode Hall Law School. Alvin ceased practicing law in 2004, when he and his wife Arlene began living permanently in Oaxaca. Since that time, Alvin has written over 90 articles about life and cultural traditions in and around Oaxaca and its central valleys, for newspapers, magazines, and websites promoting tourism in Mexico and abroad. Alvin and Arlene operate Casa Machaya Oaxaca Bed & Breakfast. This page has been visited times since October 9, 2009.